This is the month of ‘lurve’, and the little ‘tommies’ (Crocus tommasinianus) on my lawn are powering away in the February sunshine. 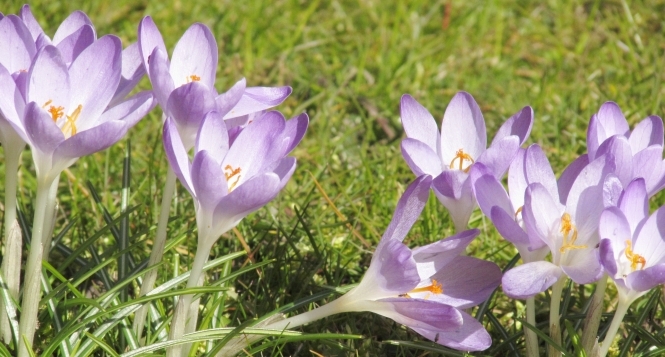 This little crocus is a must-plant; not only the earliest crocus to flower – particularly in a warm, sunny position – but also one of the best to naturalise in grass on lawns. But you must not be a picky gardener; either that or you should plant it in a meadow setting, cut first in June when all the bulb foliage has died back. My little crocus ‘lawn’ is mown as late, in April/early May, as I can bear to leave it. Cut too soon and you reduce flowering and spread.